UK: Delays have taken place in the construction of the foundations for Mitsubishi's 7MW SeaAngel turbine at the Hunterston Test Centre for Offshore Wind in North Ayrshire, Scotland. 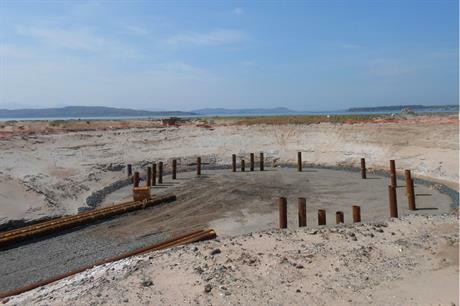 The 24MW Hunterston demo project is being developed by utility SSE and Scottish Enterprise. The second base, which will be used for the Mitsubishi turbine, had difficult ground conditions causing SSE challenges and delays in the programme. Scotland’s first offshore turbine test site will see the development and testing of three turbine prototypes on land enabling 24-hour access to make modifications and repairs. SSE will complete the turbine foundation in early spring 2014 with delivery of the prototype Mitsubishi turbine taking place in May 2014. All the components for Siemens' SWT-6.0-154 turbine have been delivered to the site and the turbine is due to be installed any day now. North Ayrshire Council granted an application for a relaxation of Condition 19 of the original planning consent, which restricts construction work from March to September. This was achieved following consultation with bird protection charity RSPB. SSE will employ an ornithologist to monitor bird movements during the winter months to ensure no negative impacts to the environment surrounding the test site. An SSE spokesperson said: "We are pleased to work within the revised guidelines agreed by RSPB and North Ayrshire Council and are grateful for their flexibility in allowing work on this important national project to continue." The facility, owned by port company Clydeport, will see the prototypes tested for five years.